Save AED 31 (52.54%) – Earn 3 Shukrans What is Shukran? Shukran is the Landmark Group’s award-winning loyalty programme in the Middle East, which allows you to earn Shukrans when you shop any of our brands. Let your little princess enjoy a luxurious softness by covering her in this soft and smooth blanket. 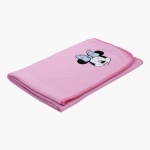 The Minnie Mouse print on one corner looks attractive while the soft material lends your kid a peaceful sleep at night.